My name is Marc van der Aa. I have a background and education as a goldsmith, artist and museum restorer. I have a lot of knowledge about European (art) history, and I specialize in (re) creating historical metal objects. To this end I have my own bronze foundry and atelier. 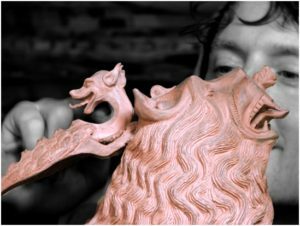 I have extensive experience in designing and modeling for bronze casting. Metal objects can be archaeological, historical or contemporary. The discipline ‘restoration’ is aimed at the respectful preservation, restoration and re-use of existing objects. As a metal restorer it is important to make a good assessment of the treatment method of your metal object. 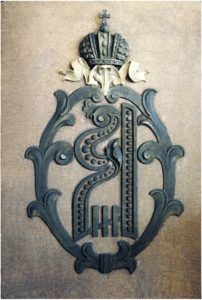 We first look at; the materials used, the manufacturing technique, the authenticity, the origin, the (restoration) history, the possible presence of marks and the style. Then the condition of the object is examined. We carry out physical procedures with materials and techniques that cause as little damage as possible to the original object and retain as much authenticity as possible. In addition to the major restoration projects, Ox Iron Art also does a great deal of restoration of smaller historical artworks such as balconies, fences or stairs in historic buildings. In addition, we are engaged for the repair of street lamps, chandeliers and basically all historical pieces made of steel. To tell heraldic characters through style characteristics, figures, colors and the matching motto, something about people, their character and life vision, profession and origin. The interest in heraldry and the desire of the citizen to confirm his identity through his own heraldic weapon and to pass it on to the offspring are increasing again. In this way we can have a weapon designed for each private person, association, institution or organization, community or municipality. 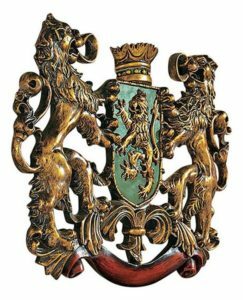 It is therefore possible for me to have your heraldic family coat of arms in bronze or another metal, for example as part of a fence, chandelier, lamp or lantern. We have unprecedented and unique experience in restoring special wrought iron pieces worldwide. As a specialist, in collaboration with Ox Iron Art, I am responsible for the entire scope of an assignment, from the first measurements to the final replacement of the restored pieces on the historical site. The Ox Iron Art team is ‘big’ in wrought iron artwork and design. But you can also go for small objects to larger assignments such as balconies, stairs, gates and large-scale fences with a very complex construction. Ox Iron Art works closely with Marc van der Aa to achieve the best possible result for our clients.